Boxers from several parts of Sheffield and South Yorkshire will be in the limelight this weekend. Doncaster featherweight Gavin McDonnell takes part in his second fight since losing his WBC World Super Bantamweight title shot against Rey Vargas, at Hull in February. He is in a six-round encounter with Jay Carney, from Liverpool, on the SKY televised undercard of Anthony Crolla v Ricky Burns, at Manchester. Darfield’s Robbie Barrett (W15 L2 D1) is on the Manchester Arena bill, defending his British Lightweight Title against unbeaten Tynesider Lewis Ritson. Southpaw Barrett, 25, is coming off an excellent points win over Scott Cardle, when he picked up the title. And that came after he won the English Lightweight strap - so he should be buzzing with confidence. Tinsley, Sheffield featherweight Muheeb Fazeldin is also due to perform on the same night at another Manchester bill, at the Bowlers Centre. Twenty four hours earlier, boxing enthusiasts will be gathering at Barnsley Metrodome for a Carl Greaves promotion. 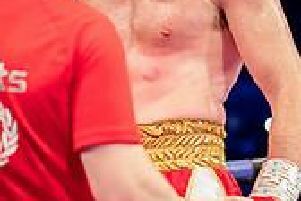 Barnsley’s Ben Wager, 27, lost his first chance at a Central Area title (super lightweight) when he was defeated by Ryan Mulcahy in Blackpool in July. He has quickly bounced back and takes on unbeaten York lightweight Danny Holmes, who is a fine prospect but has yet to face a fighter with a winning record. Barnsley super middleweight Ben Davies back in the ring for the first time since losing to Darryl Sharp in May for a central area title, in Manchester. He takes on York’s Harry Matthews. Leeds golden boy Reece Cartwright takes on rock hard 35-fight middleweight Adam Jones from Denaby Main. Southey Green middleweight Wayne Reed has his first fight since February 2016 against Sonny Whiting of Kent after months of preparation in Hillsborough. Conisbrough featherweight Tommy Chadburn will be looking to continue his unbeaten stint, against Jordan Turner, from Sutton-in-Ashfield. Wombwell welter Ross Blackwell and Stairfoot super middle Matthew Mallin also compete.